Lots of good information floating on the internet on the Proof of Concept (dubbed 'BEAST) against TLS 1.0 by Juliano Rizzo and Thai Duong at the Ekoparty. This Post summaries the credible information available. This blog post will be continuously updated as new items and possible mitigation emerge. Subscribe to the RSS feed in case you are interested in updates. More details are available on Wikipedia - The post by the TOR team does an excellent job of explaining TLS, CBC and the attack itself, I highly recommend reading it especially if you are interested in the details. Short-Term : Prioritize the RC4 Algorithm over CBC based ciphers (AES, DES). See the recommendations by PhoneFactor . My professional and private commitments made it difficult to maintain a healthly blogging style, I am trying to get back to some blogging on a more regular basis. G-SEC does no longer operate on a commercial basis, for those that want to join the G-SEC Team and blogging platform drop me (Thierry) a mail. At last. What started as an "I need an overview of best practise in SSL/TLS configuration" type of idea, ended in a 3 month code, reverse engineer and writing effort. I really hope this comes in handy for you and was worth the effort. This is the "Release candidate" version of the paper, should no errors be found it will be the final version. What SSL/TLS configuration is state of the art and considered secure (enough) for the next years? What SSL/TLS ciphers do modern browsers support ? 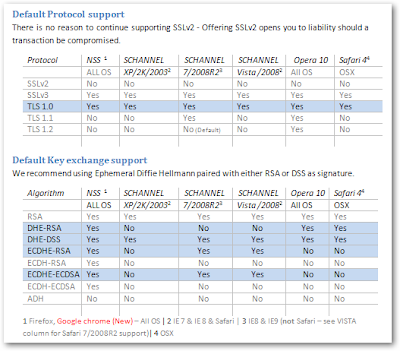 What SSL/TLS settings do server and common SSL providers support ? What are the cipher suites offering most compatibility and security ? 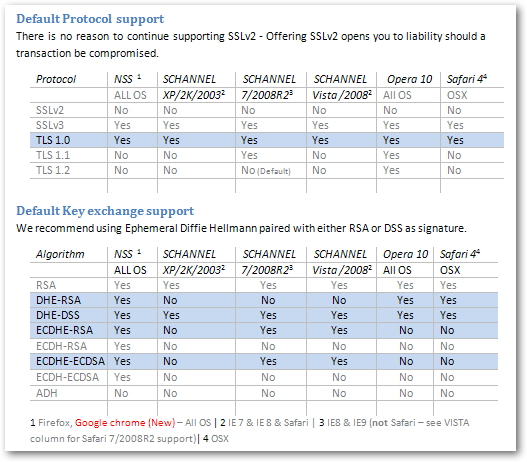 Should we really disable SSLv2 ? What about legacy browsers ? How long does RSA still stand a chance ? ^This tool specifically allows setting policies with regards to what ciphers and protocols are available to applications that use SCHANNEL crypto interface. A lot of windows applications do use this interface, for instance Google Chrome as well as Apple Safari are a few of these. By changing the settings you can indirectly control what ciphers these applications are allowed to use.